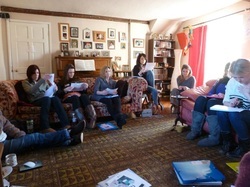 “Becoming a Midwife” Study days for aspiring midwives. We get lots of enquiries from potential student midwives asking for work experience with us, unfortunately we are unable to offer shadowing due to our client's confidentiality and the sensitivity of our work as midwives. As we cannot offer this to the aspiring student midwives who enquire, we have put together an ongoing series of very exciting, interesting and informative one-day workshops where you will get masses of information, inspiration, ideas and advice. In addition you will meet like-minded people, as well as two enthusiastic Independent Midwives and two lovely student midwives who will share their knowledge and ideas with you. Aspiring student midwives who come on our “Becoming a Midwife” courses may be on Access Courses, or planning to be on one; they may be at school; they may be at College or they may be changing career or even just thinking about becoming a student midwife. “Absolutely inspiring. Made me want to be a midwife so much more.”…. ” Learnt so much. So informative without being too formal“..
“ Loved talking to the student midwives – being able to ask questions and see that they are only human made me feel – “I can do it too”. Of course, coming to a workshop does not necessarily mean you will get that coveted place at University but we think (and know from feedback) that aspiring student midwives have appreciated all the info and ideas we have about preparing for get into University to study Midwifery as well as helping give you a realistic picture of what life as a student midwife will be. We also give you lots of useful insights into many midwifery topics and it’ a great chance to meet like-minded people and keep you enthusiasm fired up in what can sometimes be quite a lonely journey. We also talk about the kind of work experience that can enhance you chances of getting onto a midwifery education programme which are now all University Degree programmes.